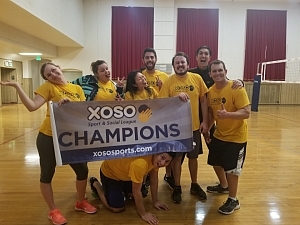 "Good Volleybrations" has won the Tuesday Volleyball championship, knocking out a tough "FC Amigos" squad in the final. The score may show 2-0, but in reality each set was extremely close, with "Good Volleybrations" pulling through in the clutch each time. Perseverance also paid off after this same team suffered a tough loss in last season's championship game. It also marks the second straight season "Good Volleybrations" has knocked "FC Amigos" from the playoffs. It was a fantastic season for "Good Volleybrations", ending their regular season as the second best team. Only "FC Amigos" was better, but head to head our champs beat them twice; once in the regular season and most importantly in the championship. They'd also finish with a league best +11 point differential, thanks in part to some dominant play this season. A great end to a successful season "Good Volleybrations", and we look forward to their title defense in the upcoming season!